Some brands are entirely predictable. We can all probably guess who buys Birkenstock sandals and Star Trek tickets, but other customer bases don’t fall as neatly into sociological boxes. For example, who the heck orders food from Blue Apron? Different people – even experts – have varying opinions based on intuition. SIGNUM Reach provides us, for the first time, the audience segments that actually make up Blue Apron’s customer base. This information should prove extremely useful to the brand in light of its recent stock struggles and the correlated threat from Amazon / Whole Foods. Reach helps brands remove the guesswork from targeting by using AI to discover audiences predictive of buyer behavior. Here’s the data for Blue Apron. The chart shows that Williams-Sonoma customers are 16.2 times more likely than the average person to spend money on Blue Apron. While the two brands may, upon some reflection, have a few affinity overlaps – high-end, luxury, urban – it’s very unlikely that the marketers at Blue Apron are directly targeting Williams-Sonoma fans on Facebook, though they clearly should. The next two entries on the list are also interesting, since they are completely different products. Sweetgreen is a niche fast-casual salad restaurant; KitchenAid is one of the world’s biggest producers of kitchen appliances. And while they’re both part of the larger food world, they don’t have much else in common other than Blue Apron being extremely popular with their customer bases. Another intriguing segment is Rent the Runway customers. RTR is a fashion startup based in New York; its members can rent extremely high-end clothing pieces for a fraction of the price of buying them. While the service does also appeal to affluent internet users, it’s in a completely different vertical outside food delivery and preparation. Yet there are RTR’s customers – 12.8x more likely to buy Blue Apron than the average person. 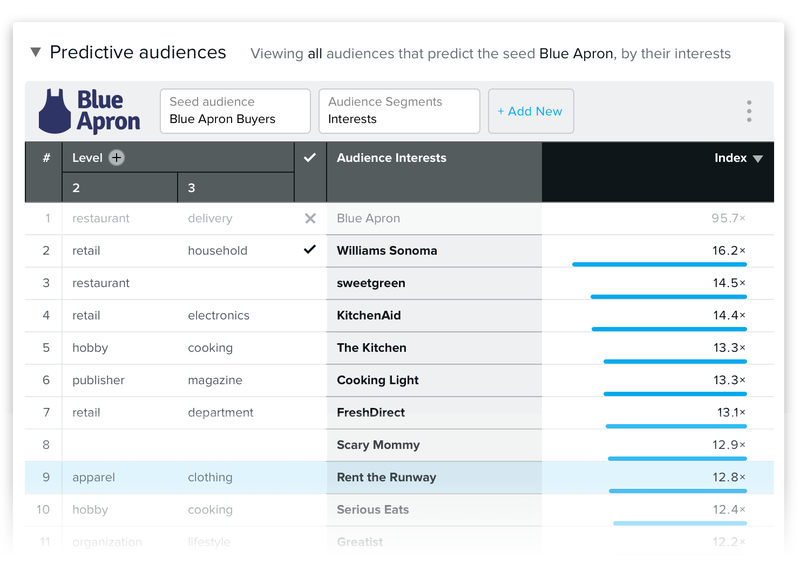 SIGNUM Reach brings these over-indexing audience segments out of the dark for brands like Blue Apron. Reach metrics have already shown a 45% decrease in cost-per-click for a major retailer using the technology. Instead of relying on intuition to decide which audience segments to target based on affinity, Blue Apron could use Reach to market to fans of Williams-Sonoma, Sweetgreen, Kitchen-Aid, and Rent The Runway on Facebook. Eclectic and unpredictable as that group might be, each audience is statistically much more likely to order Blue Apron than the rest of us are.